Well today we drove the 62_? miles and made it to Breckenridge. I have spent many family vacations in Colorado without knowing alot about it’s history. I should have paid more attention when I was younger! I am really interested to see what this week holds. Coins, nuggets, flour, flakes, or jewelry! Or maybe a combination of many.. Finds or no finds it should be a great week for fun and relaxing! Well the Toyota Sienna is packed and ready to head west to Breckenridge! Contents include the following. 1- Clothes for 5 including diapers for the youngest. 2- Garrett Ace 250 and all other detecting/panning equipment. 3- 3 fishing rods and reels. 4- Dumbells for my lovely wife to continue her P90x regimen. She is doing a great job and I am proud of her! 6- Laptop, Ipad, and all the other assorted entertainment to keep 3 boys under the age of 10 happy. 7- Golf clubs, i have heard that at higher altitudes balls travel further. I need all the help I can get! I jokingly sent PulltabMiner a text message asking if I could borrow his brand new Tesoro Compadre for the week. It runs at 12 Khz and has a smaller coil than the Garrett. I’m guessing it would be better for sniffing out gold! I am also thankful that we no longer have our Suzuki XL-7 because I am guessing we would never fit all our things in it! Ready, Set, so close to go time! Well tonight was exciting for the Ukena boys. We bought our Panning set. 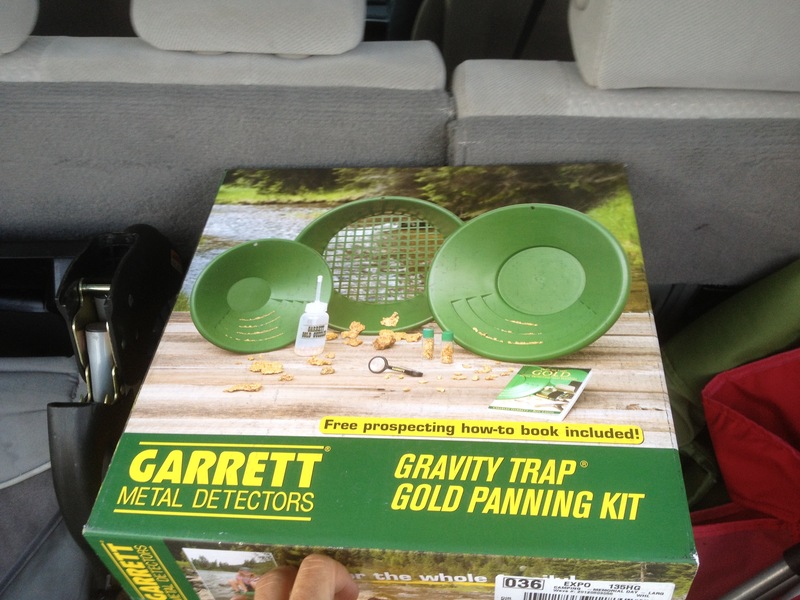 We ended up buying the Garrett Gold panning set. For the money it seems like a very good deal. Once the boys saw the packaging that includes huge nuggets in the pan they got excited. This reminded me of the Whites metal detectors TV adverts that show people casually and nonchalantly pulling treasures out of the ground every few feet! The Garrett set includes the following. Two vials that will not fit the nuggets represented on packaging..
One pair of tweezers with a magnifying glass. I bought this set specifically for the two pans. Having two pans means that the boys can pan right along with me! When we got home the boys were amped up to practice their panning skills. I promptly headed out to the garage and cut into a shotgun shell to get some pseudo treasure. Then I went to the strawberry patch and picked up some various soils. Then a big bucket to get the party started. After practicing with the pans the boys are stoked to find gold! The pans seem very easy to use and very sturdy. I can’t wait to sit down by a cool, quiet, peaceful body of water in the mountains! Happy hunting, I mean panning, or treasure hunting. How ever you do it, GOOD LUCK! 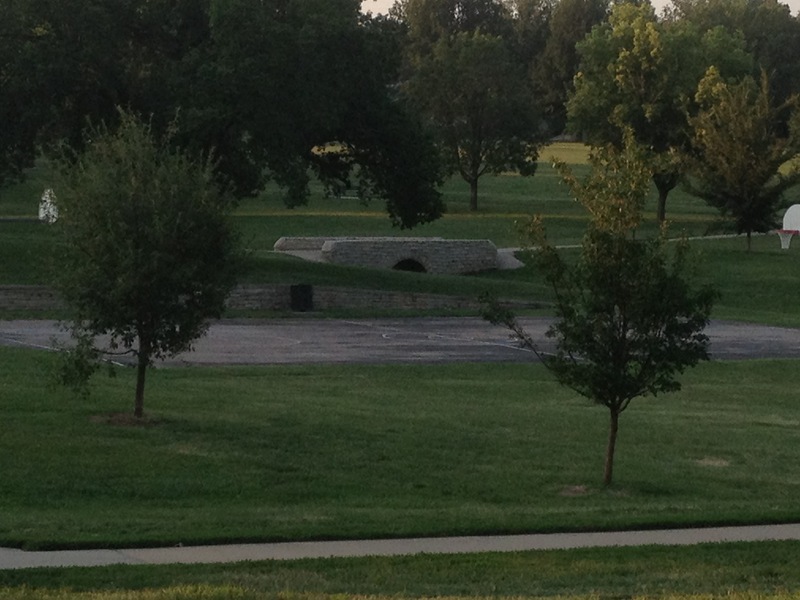 This morning I hunted a new to me part of College Hill Park in Wichita. I was quickly overloaded by the audible mixture of beeps and bells. I am thinking that there may have been some buildings in the area previously due to the amount of noise coming out of the Garrett. It was like trying to decode an infants coos, cries, and grunts. I hunted for about an hour and I only collected two coins and a bunch of pulltabs. I actually found myself wishing I had a higher end detector that would give me more information to help me decide whether or not to dig. I probably would have had better results with a sniper coil as well! Find a couple of spots where it is evident that miners have already dug to bedrock, swing the Garrett around washes, bases, and other hard pan areas where erosion has occurred. I think the Garrett will sound off if flakes/nuggets are shallow. Given the Iron ore in the ground I may have to disc out iron and listen very carefully. I am speculating that I will have to back my sensitivity down as well. If and when I find some areas that give me any mid tones at all I will dig a shovels full of dirt and re-scan the area. If the signal goes away the dirt will go into one of 2-3 buckets that will make the venture with us. I will repeat this process as necessary! The Ace isn’t designed to find micro gold but something tells me that it will be able to find several microgolds if they are close together. I will probably take my stock coil with me and see if the results are better for finding gold fines. Once I have my buckets full I will be done prospecting in Colorado. I will pan this dirt once I get back home. I am not planning on getting rich off this adventure, more than anything I just want to have a souvenir without purchasing a $20 t-shirt or a $40 hoodie! Gold will last longer than either one and it is a true souvenir unlike the imported apparel offered up in most towns flooded by tourism. Some may say I’m crazy and I wouldn’t argue. I have also learned that you never know until you try, if you don’t try you will never know! Tonight after Kolton’s baseball game the family and I went into Wichita so my wife could go to Barnes and Noble. This meant leaving my motorcycle unattended for a few hours in a public place. I hate doing that because motorcycle thefts in Wichita have been on the rise. While in Wichita my two youngest boys and I found a couple geocaches. Always fun! On my ride home I started thinking and I was somewhat saddened by my thoughts. Here they are.. I have been driving for 16 of my 32 years on planet earth. I have owned approximately 16 vehicles during that time. I have been metal detecting for about 7 months and only have one detector. Where do emotions come in? Practically every person I know wishes they hadn’t sold something in the past. I have a few vehicles that were one with my soul. 1- 1970 K-5 Blazer.. Amazing semi rare truck that was big, fast, and just plain cool! 2- 1991 Chevy Z-71 regular cab with headers and exhaust. I loved this truck for one reason. I had this truck when I met my wife. I will never forget her riding beside me on the bench seat. This is the truck that got us to Jackson Hole and back for our honeymoon. 3- 2004 Volvo S-60. The only car I have ever drove regularly. I loved everything about it! I currently have two things that are going to make me really think about emotional ties. 1- My motorcycle, I am very close to paying it off. At that time I am going to have a tough decision to make. To sell or not. It has carried me 42,000 miles and it is part of my soul. There are two bikes that I am interested in. Both are more complicated than my V-star which is a very simple machine. But I love the idea of heated handgrips on those mornings that the temp is in the teens. The two bikes I have in mind are a BMW R1200RT or a Suzuki V-Strom. I am hesitant to sell this bike because my wife has shown some interest in learning to ride. If she doesn’t, it would make a great starter bike for Kolton in a few years. Would I regret letting it go? 2- My Ace 250, I love this little machine for a turn on and go detector. Much like my motorcycleI had no idea how much I would enjoy it. I wanted to buy a machine that would allow me to be outdoors and find neat stuff. It does it! Now after seeing and learning more about detectors I kind of want to move up to a better machine. I know that PulltabMiner recently posted on his blog that he regretted selling his Ace 250. I would love to upgrade to an AT Pro, Minelab E-trac, or Whites V3i. But currently I have to wander why I would upgrade. 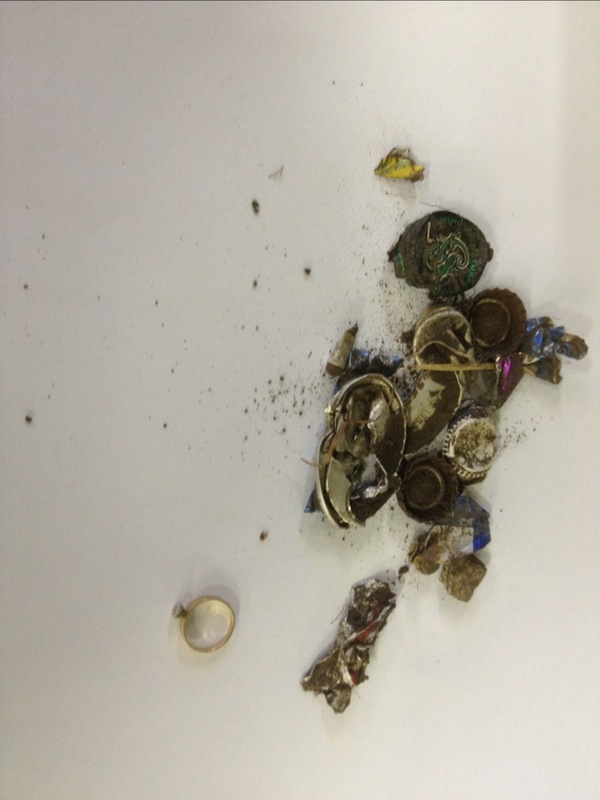 They all decipher gold ring the same as trash, and I still have gold fever! Like the title says, IT’s complicated. I don’t want to suffer sellers remorse on either! Today I left work a couple hours early. I decided that I would come home and pick up the family and hit the library. I have been itching to do more research about the gold ring I dug the other morning. I cannot find any information online about the makers mark. I found one reference to a hallmark with a circled t. I’m not sure where the struck through z comes into play. 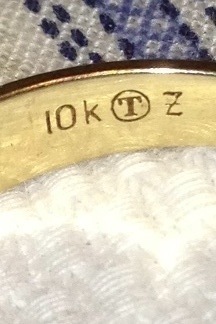 If in fact the hallmark information I have found holds true it could be a very old ring. The potential goldsmith was Eugene Toner. I have emailed a couple of antique jewelry experts in hopes that they could help me out. 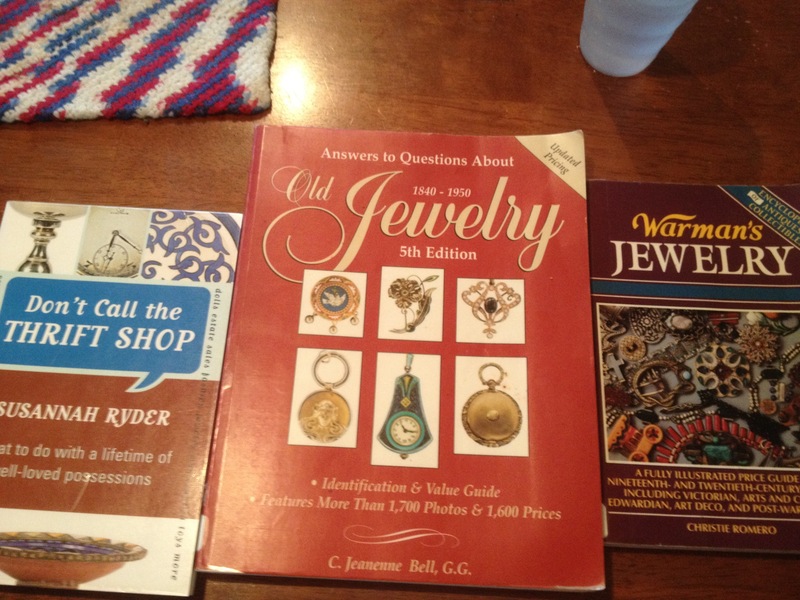 While at the library I picked up three books about antique jewelry and collecting it. I hope that I can get some very useful information from these reads. Well today at work I was discussing motorcycle safety with a co-worker. Our conversation quickly went to riding curves. I was explaining an outside-inside-outside path of travel in curves. He quickly stopped me and said that doing this would run your partner into the ditch. I thought to myself, what is he talking about a partner?? So I asked and was appalled at what I heard next. He exclaimed that when riding with someone else that it was safest to ride two abreast. I quickly started to explain a staggered formation. He stopped me and said that I was inexperienced and selfish because I only cared about my own personal safety. I tried to discuss what if’s with him… This is where I almost lost it. I said what happens if a deer approaches? Response, they go the other way due to all the loud pipes… WTH?? Seriously! What happens if their is an obstacle in the road? Response, both cyclists swerve to miss object… Feasible but I would love to see it actually happen. In the end I chalked everything up to this. Ignorance and absence of logical thinking! What good can come from riding two abreast??? Nothing came to mind. I can’t believe the lack of common sense this person was presenting. How many “Bikers” out there actually think this way? He said that riding with others in the brotherhood would make me think differently about it. In my mind does this mean that joining the brotherhood means that your buddy will take you down with him when he forgets motorcycling basics? If so count me out! I knew their was a reason I don’t want to be known as a “Biker”.. Did I mention that I have known this person for a few years and I have never seen him on a bike.. Hope he knows to look through turns and curves!! I’ll save that for another day. Maybe I’ll get him a Hi-viz yellow jacket for Christmas! I started hunting at Linwood park this morning around 6:15. 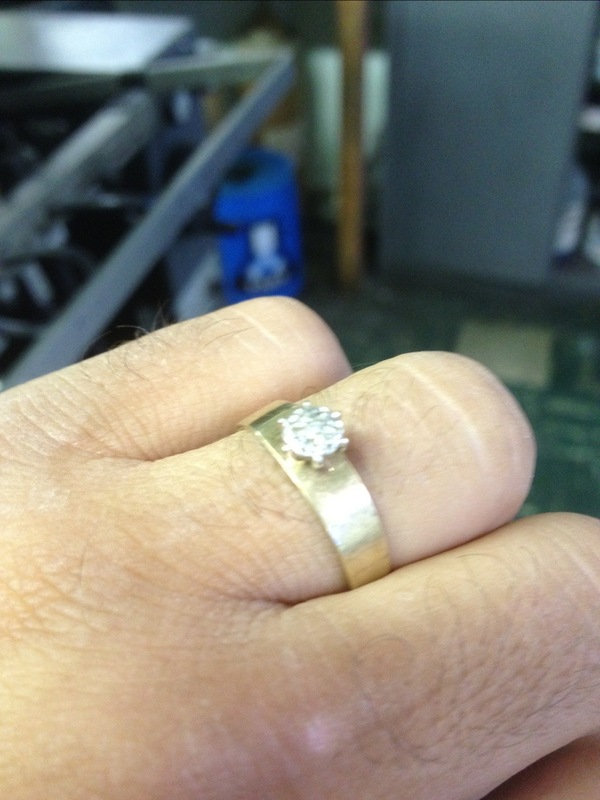 A couple days ago a guy approached us during our morning hunt and told us a lady lost a ring a couple years ago in the park. I decided to try the spot and came up with a gold ring that is embellished with 7 little diamonds. I question whether or not it is the same ring because this ring was about 5 inches deep. I would think that it’s been in the ground much more than 2-3 years. As I was making my video of this dig Redd joined me and we continued to hunt until I had to go to work. It is too early to tell if this cured my gold fever or made it worse!